Succulents are easier to grow than most, but like all plants, they have their problems, too. Although they come in a wide range of sizes, shapes and colors, succulents all share a propensity to develop fungal infections when out of their naturally dry habitats. 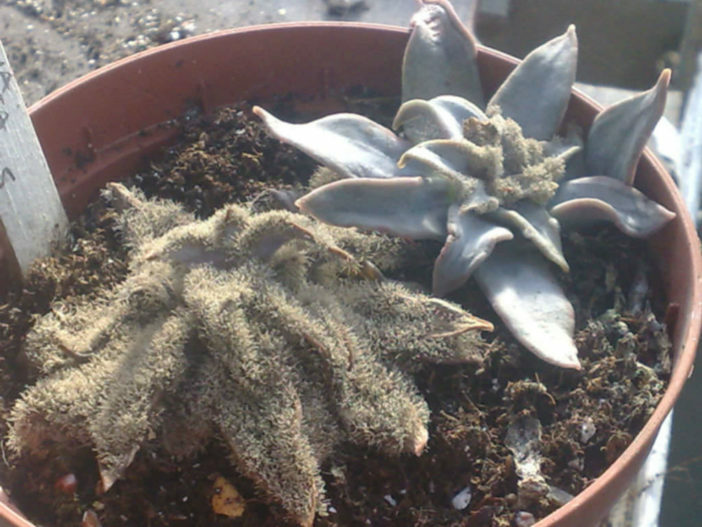 Surface fungi are easy to treat when they are present in succulents, but the various types of fungi that cause internal rots can pose much more difficult problems. Some fungal attacks are extremely difficult to stop. Sooty Mold, also called Black Mold, is among the least damaging fungi on succulents. It appears as a result of feeding by aphids, mealybugs, whiteflies and scale, as these insects exude a sweet substance called honeydew that the Sooty Mold feeds upon. To eliminate Sooty Mold, the insect infestation must be eliminated. Spraying the plant with a hose cleans off the honeydew, then an appropriate insect control method is enacted. Fortunately, Sooty Mold does not cause direct damage to succulents, though it can interfere with photosynthesis if colonies are large. Botrytis cinerea, commonly known as Gray Mold, is easy to identify by its grayish brown spore masses that form on the surfaces of affected succulent leaves and flowers. Gray Mold is most common when the weather is cool and wet in early spring or summer. It tends to establish itself in older, damaged or dying plant tissues and quickly spreads outward. Where Gray Mold is prevalent, fungicides can be used as a preventive measure, but they will not cure an infestation. Affected areas of the succulent need cutting out and burning of the damaged tissues. Watering succulents from the top is best avoided, as are allowing them to dry between watering and not leaving stubs when taking cuttings. Succulents have demonstrated a wide tolerance to the fungi that cause leaf and stem spots. For the most part these fungi are harmless, although they can disfigure landscape plants pretty severely. Shallow tan lesions appear on susceptible plants, creating a permanent stippling or spotting. In the landscape, replacing the plant with a more resistant cultivar may be warranted or spots can simply be tolerated, as they do very little damage despite their appearance. Heavily infested succulents may spread spots to other plants, but generally fungicide is not recommended. Anthracnose is caused by fungi in the genus Colletotrichum and affects a wide range of cacti and succulents. It often appears as a moist tan colored rot with red, orange or pink pustules on the surface. Spots start small, but expand rapidly on both leaves and crowns. Once a succulent is infected, the only treatment is removal and destruction of affected leaves. Anthracnose can be spread through contaminated pots or soils, so tools and pots require thorough disinfecting and garden soil is not reusable. Application of copper fungicide may help to destroy fungal bodies. The pathogen that causes Fusarium Wilt is Fusarium oxysporum. Fusarium Wilt interferes with a succulent’s ability to take up water, causing heavy stress, wilting, yellowing and sometimes death. This incurable soil-borne fungus enters the plant through the roots and begins reproducing in the vascular tissues. Eventually, these tissues become blocked, making it difficult or impossible for succulents to transport water. If tissues are cut open, brown streaks are observed. Practicing good sanitation when working with potted plants prevents Fusarium Wilt’s spread. Affected landscape plants are fed and watered properly to help them survive until they can grow new, unaffected tissues. Watering is continued sparingly to discourage future fungal growth. A variety of root and crown rots are caused by the fungal pathogens of genus Phytophthora. Unfortunately, these diseases are difficult to differentiate from the early stages of other fungal diseases since their symptoms are largely non-specific. Affected plants become stressed, wilt, change colors and eventually die from a slow rot that develops upward from the soil level. Although root and crown rots don’t respond well to treatment, they can be discouraged by planting succulents in well-draining soils and being careful not to overwater.